Heuglin's Gull or Siberian Gull, Larus heuglini, is a seabird in the genus Larus. It is closely related to the Lesser Black-backed Gull, Larus fuscus, and is often classified as a subspecies of it. 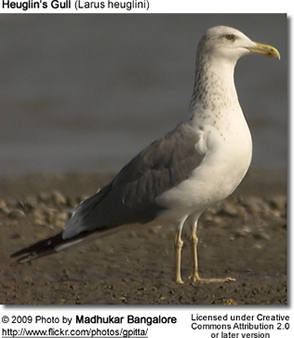 It has also been included within the Herring Gull, Larus argentatus. Birds in the eastern part of Heuglin's Gull's range are often paler grey above and are frequently considered to be a separate subspecies Larus heuglini taimyrensis (Taimyr Gull). 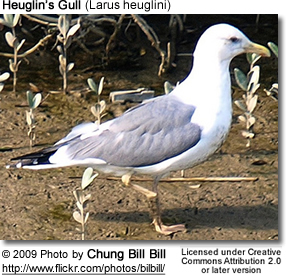 Another possibility is that they are a result of hybridization between Heuglin's Gulls and Vega Gulls. They are large gulls with a rounded head, strong bill and long legs and wings. 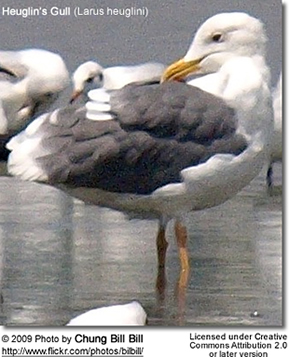 The back and wings are dark grey, variable in shade but often similar to the graelsii race of Lesser Black-backed Gull. In winter the head is only lightly streaked with brown but there is heavier streaking on the hindneck. The legs are usually yellow but can be pink. Moulting takes place later than in most of their relatives so birds still have unstreaked heads and worn primaries (longest wing feathers) in September and October. The primary feathers may not be fully grown until February or March when the head is still streaked. Heuglin's Gulls breed in the tundra of northern Russia from the Kola Peninsula east to the Taymyr Peninsula. They are regularly reported from Finland and may breed there. They migrate south to winter in Southwest, South and East Asia and East Africa. Small numbers are seen in Southeast Asia, it has been recorded in South Africa and it may occur as a vagrant in Western Europe. They feed mainly on mollusks, worms and crustaceans. Craig Robson (2002) A Field Guide to the Birds of South-East Asia. New Holland, London. Adrian Skerrett, Ian Bullock and Tony Disley (2001), Birds of Seychelles, Christopher Helm, London.